The 1976 Tehran UFO Incident was a radar and visual sighting of an unidentified flying object (UFO) over Tehran, the capital of Iran, during the early morning hours of 19 September 1976. During the incident, two F-4 Phantom II jet interceptors supposedly lost instrumentation and communications as they approached, only to have them restored upon withdrawal; one of the aircraft also supposedly suffered temporary weapons systems failure, while preparing to open fire. The incident, recorded in a four-page U.S. Defense Intelligence Agency (DIA) report distributed to at least the White House, Secretary of State, Joint Chiefs of Staff, National Security Agency (NSA) and Central Intelligence Agency (CIA), remains one of the most well-documented military encounters with anomalous phenomena in history, and various senior Iranian military officers directly involved with the events have gone on public record stating their belief that the object was not of terrestrial origin. At approximately 0030 hours local time (2100Z), 19 September 1976, the Imperial Iranian Air Force command post at Tehran received four reports by telephone, from civilians in the Shemiran city district, of unusual activity in the night sky. The callers reported seeing an object similar to a star, but much brighter. When the command post found no helicopters airborne to account for the reports, they called General Yousefi, assistant deputy commander of operations. General Yousefi at first said the object was only a star, but after conferring with the control tower at Mehrabad International Airport and then looking for himself to see a very bright object larger than a star, he decided to scramble one F-4 Phantom II jet fighter from Shahrokhi Air Force Base in Hamadan, approximately 175 miles (282 km) west of Tehran (for location see map at right). 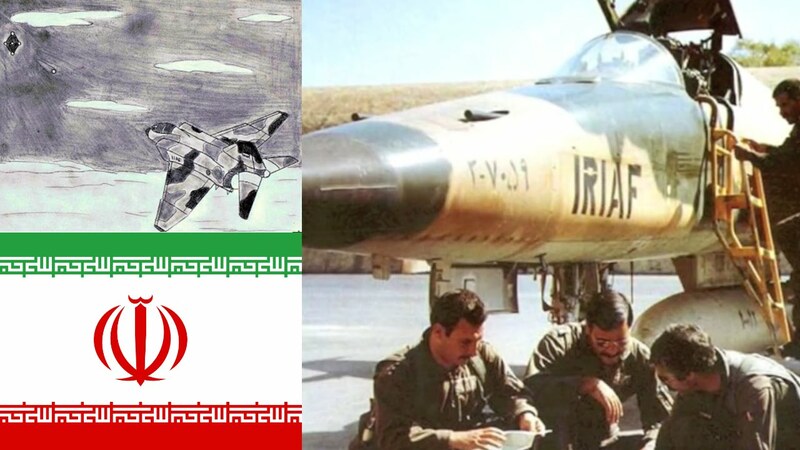 At 0130 hours (2200Z), the F-4, piloted by Captain Mohammad Reza Azizkhani was launched and proceeded to a point 40 nautical miles (74 km) north of Tehran. It was noted that the object was of such brilliance that it could be seen from 70 miles (110 km) away. When the aircraft approached to approximately 25 nautical miles (46 km) from the object, the jet lost all instrumentation and communications capabilities, prompting Azizkhani to break off the intended intercept and turn back toward Shahrokhi; upon the evasion, both systems resumed functioning. At 0140 hours, a second F-4 was scrambled, piloted by Lieutenant Parviz Jafari and Lieutenant Jalal Damirian. Jafari would eventually retire as a general and participate on 12 November 2007, at a National Press Club conference demanding a worldwide investigation into UFO phenomena. Jafari’s jet had acquired a radar lock on the object at 27 nautical miles (50 km) range. The radar signature of the UFO resembled that of a Boeing 707 aircraft. Closing on the object at 150 nautical miles (280 km) per hour and at a range of 25 nautical miles (46 km), the object began to move, keeping a steady distance of 25 nautical miles (46 km) from the F-4. The size of the object was difficult to determine due to its intense brilliance. The lights of the object were alternating blue, green, red, and orange, and were arranged in a square pattern. The lights flashed in sequence, but the flashing was so rapid that they all could be seen at once. While the object and the F-4 continued on a southerly path, a smaller second object detached itself from the first and advanced on the F-4 at high speed. Lieutenant Jafari, thinking he was under attack, tried to launch an AIM-9 sidewinder missile, but he suddenly lost all instrumentation, including weapons control, and all communication. He later stated he attempted to eject, but to no avail, as this system, which is entirely mechanical, also malfunctioned. Jafari then instituted a turn and a negative G dive as evasive action. The object fell in behind him at about 3 to 4 nautical miles (7.4 km) distance for a short time, then turned and rejoined the primary object. Once again, as soon as the F-4 had turned away, instrumentation and communications were regained. The F-4 crew then saw another brightly lit object detach itself from the other side of the primary object and drop straight down at high speed. The F-4 crew expected it to impact the ground and explode, but it came to rest gently. The F-4 crew then overflew the site at a decreased altitude and marked the position of the light’s touchdown. Jafari would later comment that the object was so bright that it lit up the ground and he could see rocks around it. The object had touched down near Rey Oil Refinery on the outskirts of Iran. Then they landed at Mehrabad, noting that each time they passed through a magnetic bearing of 150 degrees from Mehrabad, they experienced interference and communications failure. A civilian airliner that was approaching Mehrabad also experienced a loss of communications at the same position relative to Mehrabad. As the F-4 was on final approach, they sighted yet another object, cylinder-shaped, with bright, steady lights on each end and a flashing light in the middle. The object overflew the F-4 as they were on approach. Mehrabad tower reported no other aircraft in the area, but tower personnel were able to see the object when given directions by Jafari. Years later, the main controller and an investigating general revealed that the object also overflew the control tower and knocked out all of its electronic equipment as well (see below). The next day, the F-4 crew flew out in a helicopter to the site where they had seen the smaller object land. In the daylight, it was determined to be a dry lake bed, but no traces could be seen. They then circled the area to the west and picked up a noticeable “beeper” signal. The signal was loudest near a small house, so they landed and questioned the occupants of the house about any unusual events of the previous night. They reported a loud noise and a bright light like lightning. Further investigation of the landing site, including radiation testing of the area was apparently done, but the results were never made public. Since this event occurred before the fall of the Shah, any records in Tehran may be lost. a) The object was seen by multiple witnesses from different locations (i.e., Shamiran, Mehrabad, and the dry lake bed) and viewpoints (both airborne and from the ground). b) The credibility of many of the witnesses was high (an Air Force general, qualified aircrews, and experienced tower operators). c) Visual sightings were confirmed by radar. d) Similar electromagnetic effects (EME) were reported by three separate aircraft. e) There were physiological effects on some crew members (i.e., loss of night vision due to the brightness of the object). Opinions of some participantsIn 1994, the Sightings TV program tracked down and interviewed various principals involved in the incident. Nearly all expressed the opinion that they were dealing with a high-technology extraterrestrial craft. Yousefi repeated many of the details of the encounter already recorded in the DIA document but also added a few more. Yousefi said that after the second F-4 lost its communications and weapons systems and took evasive maneuvers, it tried one last pursuit of the UFO. Even approaching at Mach 2, the UFO easily outdistanced it. The pilots decided to return to Mehrabad airport. As they were approaching to land, Yousefi said the control tower phoned him that the UFO was following the jet back to base. The control tower supervisor, Hossein Pirouzi, told Sightings that the pilot was in a panic with the large UFO on its tail. According to Pirouzi and other controllers, the UFO performed a low-altitude flyby over Mehrabad at about 2200 to 2,500 feet (760 m). It was described as a cylinder-shaped object as large as a tour bus, with bright steady lights on each end and a flasher in the middle. During the flyby, the control tower lost all power, although other parts of the airport were unaffected. After the flyby, the UFO took off to the west and was spotted 25 minutes later over the Mediterranean by an Egyptian Air Force pilot, then again over Lisbon, Portugal by the pilot, crew, and passengers of a KLM flight, reporting that it was speeding westward over the Atlantic Ocean. The following day, an investigation was held in Tehran. The Iranian Air Force Deputy Commander, Lieutenant General Abdollah Azarbarzin, conducted interviews with all of the principals and wrote up a report. Gen. Jafari, the second F-4 pilot, stated that he was among those interviewed and an American colonel sat there and took notes. This information later appeared in the D.I.A. account of the incident. Azarbarzin also said that the copilot got a good look at the UFO when the second F-4 came out of its emergency dive and passed underneath it. He told both Sightings and researcher Dr. Bruce Maccabee the copilot could see the shape, which he said was round like a plate or just like a saucer, with a canopy or cockpit that looked like half a ball bathed in a dim orange or yellowish light, but with no visible crew. When all factors were considered, including the extraordinary rate of acceleration displayed by the UFO, Azarbarzin concluded that the UFO had outperformed any known human aircraft. Gen. Azarbarzin also told Maccabee that the complete records of the investigation had been turned over to the U.S. Air Force. However, the USAF has steadfastly maintained that their only record of the incident was provided in the DIA document originally prepared by a USAF officer who interviewed the pilot of the second F-4. The article also recounted how the pilot spoke of a “bright round object, with a circumference of about 4.5 meters, leave the UFO.” It also said that the authenticity of the object had already been confirmed by the two F-4 pilots, several control tower operators, and witnesses on the ground who reported a “bright body” flit across the sky while others reported seeing “some bright thing” fall from the sky. Another document later came to light revealing that a very similar UFO was sighted in Morocco from many locations about 3 to 4 hours later, or 0100 to 0200 hours local time on 19 September. The document was from the American embassy in Rabat, Morocco to the U.S. State Department, dated 25 September 1976–“Subject: Request for Info. Unidentified Flying Objects.” It recounted that the Moroccan police had received numerous reports of an object generally flying parallel to the Atlantic coast at low altitude. It had a silvery luminous circular or tubular shape and was giving off intermittent trails of bright sparks and fragments. It made no noise. One of the embassy’s unnamed briefers said he had seen it himself, and that it appeared to be traveling slowly like an aircraft preparing to land. At first it appeared disc-shaped, but took on a tubular appearance as it got closer. Secretary of State Henry Kissinger responded ten days later and took the official U.S. policy line on UFOs. Kissinger claimed the Condon Committee report had shown that all UFOs could be attributed to natural causes and no further study was warranted. Kissinger said people had probably seen a meteor or a decaying satellite part for which there was no re-entry record. In 2012, amateur satellite observers identified the cause of the Moroccan sightings as the re-entry of the “BOZ ullage motor assembly ejected from the third stage of the Molniya rocket that orbited Molniya 1-35”. They produced a ground track plot that shows that the re-entry trajectory passed within sight of all locations from which UFO sightings were reported. Skeptical explanation and analysisIn his book UFOs: The Public Deceived, journalist Philip J. Klass claimed the witnesses initially saw an astronomical body, probably Jupiter, and pilot incompetence and equipment malfunction accounted for the rest. The bright object was first noticed by witnesses in Shemiran, the northernmost district of Tehran. One of the witnesses in the northeastern part of Tehran was Gen. Yousefi himself, who ordered the jet interceptions. The jets were scrambled from Shahrokhi AFB in Hamadan, about 175 miles (282 km) west-southwest of Tehran, and vectored to a point 40 miles (64 km) north of central Tehran. However, Jupiter was in the east. Thus the UFO was approximately 90 degrees away from Jupiter at the time. In addition, the second F-4 chased the UFO from northern to southern Tehran. Again, Jupiter would be at nearly 90 degrees to the pursuit trajectory. Furthermore, both F-4’s picked up and tracked something on their radar, impossible for an astronomical object like a star or planet. Many more details of the encounter do not match Klass’ proposed explanation, such as both F-4’s and the control tower losing their electronics with close approach to the UFO and a third civilian plane in the region also losing communications. SummaryThe incident is regarded by a number of UFO researchers to be one of the premier UFO encounters ever recorded. Some researchers consider it strong evidence for the extraterrestrial origins of the UFO because there was a blackout on the F-4 just when it was going to fire and because of instrumental breakdowns on two different aircraft while they were on the chase. A military spy satellite also recorded this incident. The DSP-1 satellite detected an infrared anomaly during the time of this event that lasted for about an hour. The Tehran incident was considered one of the ten best UFO cases in a 2007 Canadian documentary Best Evidence by film maker Paul Kimball. The list of best cases was compiled by polling leading UFO researchers. At a press conference at the National Press Club in Washington D.C. on 12 November 2007, the pilot of the second F-4, General Parviz Jafari, recounted how he tried to intercept an “object which was flashing with intense red, green, orange and blue light.” Jafari said that, “Four other objects with different shapes separated from the main one, at different times during this close encounter. Whenever they were close to me, my weapons were jammed and my radio communications were garbled. One of the objects headed toward me. I thought it was a missile. I tried to launch a heat seeking missile to it, but my missile panel went out. Another followed me when I was descending on the way back. One of the separated objects landed in an open area radiating a high bright light, in which the sands on the ground were visible. We could hear emergency squash all the way, which was reported by other airliners flying at the time and continued for another couple of days. During my interview at H.Q, after the incident, an American colonel took notes…” When asked if he thought this was an alien spacecraft, he said he was quite sure that it was. 1978 Tehran UFO incidentsA somewhat similar UFO incident over Tehran occurred in 1978, again involving electromagnetic interference and U.S. DIA interest. The report was sent by the U.S. Defense Attache’s office to the Joint Chiefs of Staff, part of the normal routing for foreign intelligence reports. As in the 1976 case, the distribution list included the Secretary of State, the NSA, and the CIA. The report was quoted from the Iranian English-language newspaper Tehran Journal, dated 18 July 1978. The article also briefly mentioned another recent UFO incident from April 1978. A local pilot said that he and his copilot had photographed a “glittering” object while flying between Ahvaz and Tehran. (Ahvaz is about 750 miles (1,210 km) southwest of Tehran.) He could not release the photographs until the security division of the civil aviation authorities gave permission. Apparently there was also ground radar corroboration. “A Mehrabad radar control official said that on that occasion they had detected an object some 20 times the size of a jumbo jet on their screens.” Civil aviation authorities were said to be investigating, but the results had not been made public.